A thirty-five-year-old man experiences fever, chills, and body aches. He presents to the emergency room at Holy Cross Hospital with elevated body temperature, pulse rate, respiratory rate, and white blood count. The man's medical history includes a splenectomy and a hip replacement. Based on the man's symptoms, coupled with his surgical history, the doctor should have recognized that the man had signs of early sepsis requiring further evaluation. Instead, the doctor concludes that the man is suffering from a viral syndrome and discharges him after a simple fluid resuscitation. In these types of cases, the victim's malpractice attorneys are rarely arguing that the physician should have known with certainty that the patient was septic during the evaluation, and that is probably the case here. More typically, the plaintiff's lawyer is contending that while the symptoms could be attributed to any number of different causes, the collective presentation of symptoms would lead a prudent doctor to raise the suspicion of sepsis and conduct a more meaningful inquiry. The man follows up with his primary care physician the next day, who sees the signs of advanced sepsis and immediately transfers the man to a local hospital by ambulance. The man requires immediate emergency treatment. It is too late. The man dies of septic shock the following day, two days after his admittance to Holy Cross Hospital. The man's family files a wrongful death medical negligence lawsuit and survival action of the man's estate lawsuit in Montgomery County. They allege that the Defendants violated the standard of care by failing to properly diagnose the man and subsequently failing to provide him with the appropriate treatment. If the emergency room had timely and appropriately evaluated, diagnosed, and treated the man, the sepsis would not have progressed to the point at which his respiratory status deteriorated and led to his death. It is alleged that Defendants' negligence caused the plaintiff's physical pain, emotional anguish, fear, anxiety, and culminated in his tragic and unnecessary death. The man's mother and father each filed a wrongful death lawsuit against the same Defendants. The settlement conference in this case will be on December 9, 2016. If the case does not resolve, a trial date will be set in 2017. If you have been harmed or have lost someone you love as the result of a medical error by a doctor or hospital, we can help you. Miller & Zois has a history of success in getting large verdicts and settlements in medical malpractice cases for our clients. Call us today at 800-553-8082 or get a free, no obligation online case review. There is no cost or fee of any kind for this consultation. We will discuss the best path forward for you to receive compensation for the suffering you have endured. What is the settlement and trial value of your medical malpractice claim in Maryland? Another sepsis malpractice case filed against Kasier in August 2016. Another ER malpractice case filed in Maryland in 2016 in involving pulmonary embolism after a lap chole. 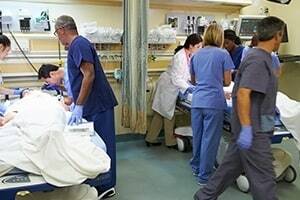 How much money can you expect to recover in a successful emergency room medical malpractice claim in Maryland?